Moles can cause a large amount of amenity damage to gardens and sports areas. As such there are two methods of control available. For a small area affected with no surrounding infested areas, gassing of the moles may be effective. Public domainThis would require 3 visits in a single week (We would schedule them for the Monday, Wednesday and Friday) where the gassing can take place. This will only take place if the area is over 10m from any occupied building. Trapping is the normal method we employ and we would need to have access to the area every day from Monday to Friday. Trapping will require holes to be dug in the area affected. While taking every precaution to return lawn areas as far as possible to the state prior to treatment, you need to be aware that there will be some disturbance in your lawn. This is not normally a problem as the damage done while trapping will be less than that caused by the moles. 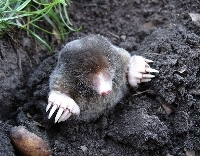 The council does not have a legal duty to provide a pest control service to control Moles. The cost of one weeks trapping is currently £177.60 (Incl VAT) and will require us to have access to your property at least once every day. The traps require to be checked once per day and reset if moles are trapped. This should be discussed with the pest control officer on his first visit on the Monday after you request the service. We aim to attend calls within 5 working days. It is preferable that we set the traps on the following Monday to your call and therefore a weeks trapping will consist on visits throughout that week to check traps and dispose of any trapped animals. The traps would then be removed on the Friday of the same week. This would then constitute one weeks trapping. There is no preparatory work required by householders or tenants prior to the initial visit. This all depends on the level of infestation however, you should discuss this with your officer during the first visit. There is nothing that can be done realistically to prevent re-infestation of moles.